The latest HP notebook is the Windows 8-running Envy x2, just announced over at IFA 2012. If there's a computing theme at IFA 2012 this year, it's laptops that can become tablets and vice-versa. HP is the latest to join the party, with the HP Envy x2 touted as "the right device for the right time, every time" in a press release presumably written by Brian Fantana. 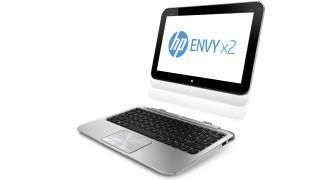 With an aluminium finish and an 11.6-inch HD IPS screen, the Envy x2 will make use of Windows 8's touch-friendly interface. It comes with an 8MP camera on the back and an HD webcam facing frontwards, and HP reckons you'll get 14 hours of battery life out of it if you're lucky. Other extras include Beats Audio enhancement and NFC for contactless data transfers and the like. Like all the Windows 8 hardware we've seen so far, the HP Envy x2 will be available from late October, with pricing starting from £799 (US pricing TBC). Also on show in Berlin are the HP Spectre TouchSmart Ultrabook and the HP Spectre TouchSmart Ultrabook 4. The unnumbered of the two is a 15.6-inch laptop with a full HD IPS screen and a waist size of 17.9mm. It features edge-to-edge glass and is the first HP laptop to come with Intel Thunderbolt for lightning speed data transfer. It also comes with the latest Intel Core processing options and an mSata SSD and will be landing in the UK in late November 2012, with prices starting at £1,199. In the US, there's a slightly longer wait until December, and prices from $1,399.99. The Spectre TouchSmart Ultrabook 4 is very similar internally, but comes with a 14-inch screen and 23mm thickness – and a lower price of £899 (US pricing to be announced).